Hello friends, thanks for calling by. Today I have the three cards that we will be making in both of our October Card Classes. 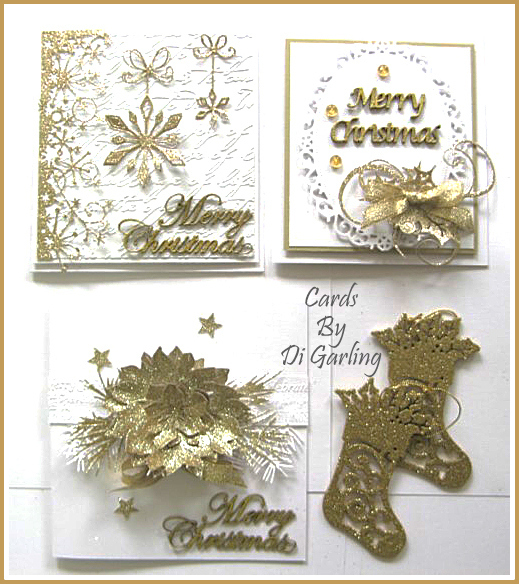 Yes are are doing Christmas cards this month with a colour scheme of white & gold. We love this gorgeous gold glittery paper we are using but unfortunately these pics are NOT the best !!!! Don't you just love that gold glittery pointsettia on the bottom left one? Class Times Friday 9th October from 10am to 2pm OR Friday 23rd October September from 10am to 2pm Cost is $35 for the 4 hour class & includes all materials & equipment.